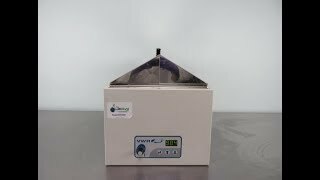 The VWR Digital Shaking Water Bath offers digitally controlled oscillation and temperature, in an easy to use and maintain lab staple. This 18-liter shaking water bath is built for a life with over-temperature protection to preserve the heating element and components, a stainless-steel interior and tray to resist corrosion, and a powder coated exterior for durability. The soft-touched keypad featured on the VWR shaking water bath, allows control of temperature, oscillation speed, and calibration on the easy to read brightly lit display. The model 89032-226 shaking water bath has an oscillation rate of 40-400 rpm with an 18-mm stroke, and a temperature range up to 99°C. The VWR 89032-226 water bath also has an air jacket design that features a non-contact, recessed heating element to avoid hot spots and burnouts. The stainless gabled lid of this water bath helps to channel away condensation from dripping back down onto the samples. 42 x 23.5cm/ 16.5" x 9.3"
27 x 57 x 33.5 cm/ 10.6" x 22.4" x 13.2"
This VWR Digital Shaking Water Bath has been fully inspected and is performing to expectations. All of our lab equipment comes backed with our standard warranty. Should you have any questions, please don't hestiate to contact us.